Ever had someone do something small that just made your day? I have. Years ago, I was standing in the grocery store isle with what must have been the most awful look on my face. A man walked past me, never stopping, and said, "Smile. God loves you." It was the most random act but after 20+ years, it's still with me. Below is a simple list of acts to make someone's day. I've heard tell that it usually bounces right off and brightens ours as well. Be sure to add your thoughts and ideas. 1. Drop a penny where someone will find it. 2. Let the other person have the parking space. 3. Finish a task for someone who's tired. 4. Let a mother of young children go ahead of you in line. 5. Bring a tall glass of iced tea, water, or lemonade to someone who's working outside. 6. Praise a job well done, even if it's something you expected that person to do. 7. Meet someone more than halfway. 8. Ask an older person for his or her opinion. 9. Greet everyone you meet today with a smile. 10. Give a toast to someone. 12. Keep a secret secret. 13. Send flowers or a card for no reason except to say you care. 14. Call a friend on the spur of the moment and go to a movie. 15. Thank your parents for things they did (and put up with!) when you were younger. 16. Pay the tab for the person behind you in a drive thru. 17. Compliment a stranger on her hairstyle or outfit. 18. Do a chore for your spouse so he or she can sleep in. 19. When someone lives her life in a way that you admire and want to emulate, tell her. 20. Don't worry if you want to honor someone and you're short on money. When you give someone your presence, you're giving the most. 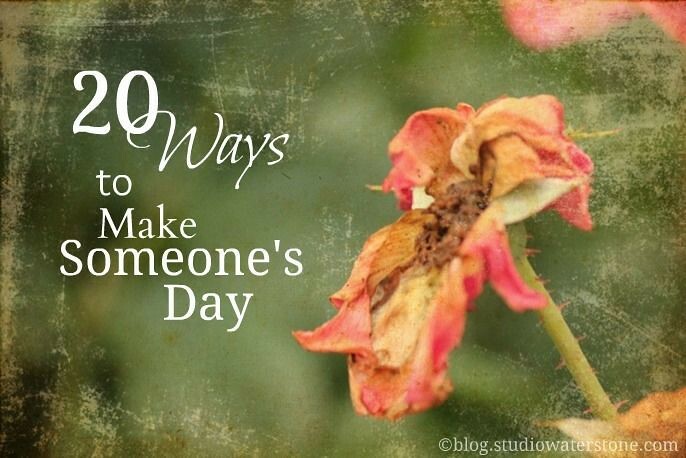 Can you think of a way to make someone's day? Great ideas Lori! I try to give smiles. Yesterday on my morning run I saw an older couple sitting in their garage. I did not know them because they live a few streets away. We shared smiles and waves - it made my day! I'm loving my purse! 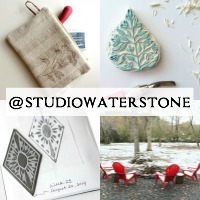 I will share on the blog one of these days. Summer with the kids is all air traffic control....I hope you are enjoying yours! Those are great ideas. Thanks for sharing ! Thanks for the suggestions. We've been known to secretly pay for someone's meal at our local restaurant. And a smile can go a long way. I try to do something everyday but I guess that isn't that challenging when you are a Mom, LOL!!! I love your new design here Lori. Let's see...for me it's a smile and a wave to a complete stranger who is not looking too happy. Even if only for a second, it works every time. T - What a great story! Loving everyone's ideas, too. Thanks so much. I think just being a patient driver helps everyone, including yourself. Everyone makes mistakes sometimes while driving and it's good to remember those times you've accidentally cut someone off, etc. This is a beautiful post and has reminded me to do something nice...thanks for writing this!